A week and a half ago, I posted that I was going to rip out my sweater progress and start again. I've been knitting away, and I’m back to where I was then. This time, so far, the size looks good — in any event, I’m not redoing this pullover again! The body of the sweater is nearly complete. I’m leaving the lower hem stitches on the needle while I move on to the sleeves. I may want to add a few rows to the lower hem, and this way I can base that decision on how much of my scrap yarn is still available after the sleeves are done. I’m trying to decide how to handle the lace at the lower edges of the body and sleeves. Originally, I had planned to convert it to a basic garter stitch edge to prevent the lace pattern from competing with the stripes. But after trying that a couple versions ago, I don’t like the look and want to stay with the lace. Do I stripe it, or knit it in a single color? If it’s a single color, which one should it be? Since I’m working with scraps, my choices will be limited. Meanwhile, ideas for new projects are piling up. I have yarn and patterns ready for four more projects, three of which are not wearables! What sort of progress are you making on your current projects? It’s been more than a week since I posted that I would be working toward correcting the fit issues in my two most recent knit projects. 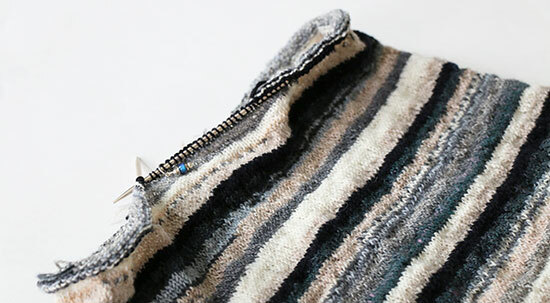 As of last night, I expected to share a positive update — the body of the new version of the striped sweater is done! But when I tried it on again this morning in the bright light of day, I saw some fit issues that I hadn’t noticed after my nighttime knitting sessions. Again, I think this is entirely user-error, not a problem with the pattern. As much as it pains me to say it — and to do it — I’m going to rip it out and start over one more time. I’ve come this far, I might as well get it right! At least I didn’t weave in all of the ends yet. On a more positive note, another change I’ve made is to the color distribution. For the earlier incarnations of this combination of scrap yarns, I made random stripes based on the varying yarn lengths I had available. Some stripes didn’t carry across a full round, while others were as long as seven rounds. This time, each color is carried for three to five rounds. While the stripes still look random, due in part to some self-striping and variegated colorways, there’s a better sense of balance. And it’s amazing how much brighter the sweater looks as a whole! I’m definitely keeping this change, and will remember the difference for future projects. What challenges have you been working to overcome in your making? Sometimes everything rolls along smoothly, and other times there are nonstop bumps in the road. I’ve hit a bumpy stretch with my knitting. I recently started knitting more tops but, as with most new things, there’s a learning curve involved. I’m learning to recognize which styles work well for my body type, which adjustments might be needed to fine-tune the fit, and which yarns will suit both the patterns and how I intend to wear the garments. The red is the original sweater, the lavender is last month’s attempt, and the gray striped version is my unfinished current project. Notice that they keep growing wider! I don’t think the problem is with the pattern. 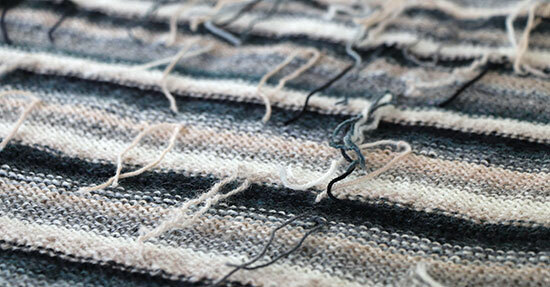 The instructions are straightforward, and the math between the stitch counts and the schematic is sound. And I know it can turn out correctly because I’ve done it once already. 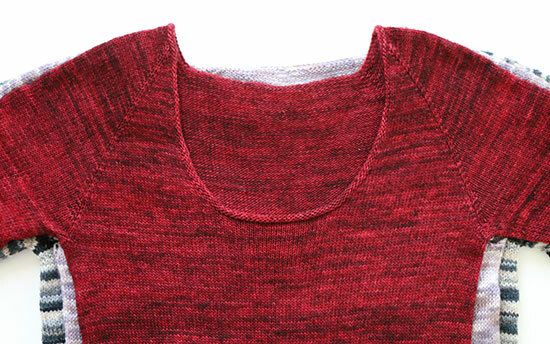 The red sweater, knit with 100% merino wool yarn, has been worn and laundered quite a bit over the years. It’s possible that it was larger when it first came off the needles and has shrunk over time. The lavender sweater was knit with Plymouth Yarn Reserve Sport, which is a blend of 45% wool, 35% silk, and 20% rayon from bamboo. Based on how much the sweater has grown in the few times I’ve tried it on — yes, it’s longer now than it was when I posted about it — I think any bounce from the wool is being overpowered by the drape of the silk and bamboo. 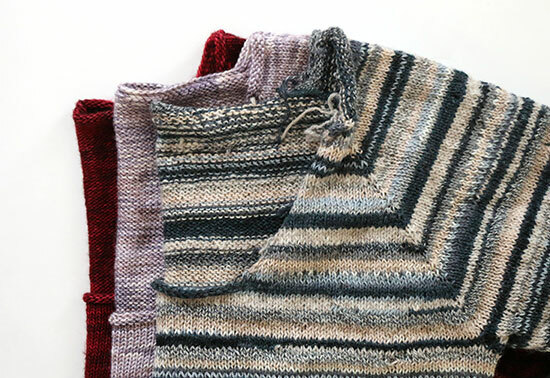 I didn’t even finish the neckline yet for the striped sweater — which would first uncurl the edge upward, then raise it by another 1/4 inch (0.6 cm) or so — and already it comes up higher than the other two necklines. But the armholes aren’t any shorter than those on the other two sweaters. Granted this sweater hasn’t been blocked yet, but something is definitely not right. It might be another yarn issue. If so, I’m not entirely sure what to make of it. I think it’s more likely that something about my knitting is affecting the result. Whatever it is, it’s pointing toward going down a size in my next attempt. Yes, you read that correctly. As much as I’d like to unravel these two newest sweaters and move on to something simpler, I’m determined to get at least one wearable pullover out of this experience! So if you need me, I’ll be over here bumping along as I undo weeks of knitting and begin again.